The market keeps moving sideways due to lack of significant t/c activity, partly because of the public holidays in the US and Europe. Oil prices reached 80 USD/barrel again yesterday on the back of the US sanctions against Venezuela and Iran. Little excitement in the dirty market with rates moving more or less sideways. 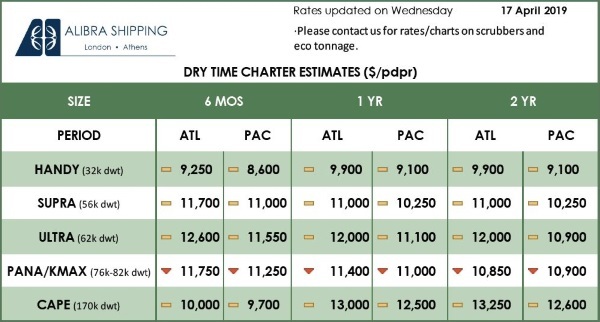 The lack of activity due to an abiding combination of scarce demand, oversupply of tonnage and high bunker prices, bars time charter rates from turning around. At best rates are flat due to insufficient volumes. On the supply side: already 24 VLCCs ordered this year. 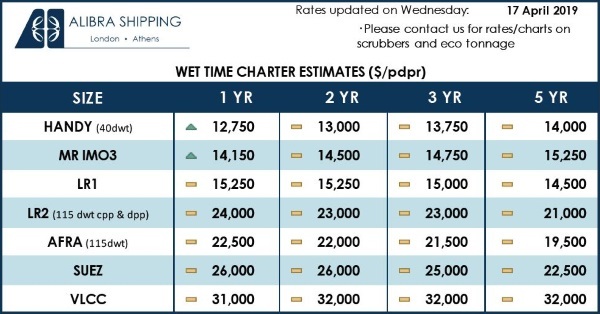 Estimated earnings of $20,000 pdpr for 1 year period charters leave the VLCC market desperate for increased volumes. Rates remain supressed as the market fails to uphold any significant momentum with VLCC period rates estimated at $21,000 pdpr. Charterers continue to chip away making the most of the bearish sentiment that dominates the market. The Easter Holidays brought slight relief with VLCC being able to get $21,750, but the crude market keeps moving sideways at the close of 2018’s first quarter. A stale market and limited activity across the board with LR2 estimated at $16,150/ pdpr for 2 year period. The tanker market remains at its weakest state in years with Suezmax estimated at 18,000/pdpr for 2 year period. Charterers continue to chip away making the most of the bearish sentiment with a market that slides along at rock bottom rates. As brokers we are disappointed to see such a stale market with little activity. Limited activity across the board and hire rates remain flat due to the Lunar New Year and few incentives for much change on the horizon.